Universals by their very nature, are a one-man machine and so not really suited to a bigger set up. I have a thing about universals that I can't get out of my system; there is something about their self-contained completeness. They do have limited appeal but importantly what they can offer, is a way of obtaining top quality machinery that is quite hard to achieve. Alan Holtham's budget workshop has shown that for you to get a good kit, you can come out with some nice gear for around Â£2,500, but in order to do this, we had to compromise. What came out of the article is that in an ideal world, you need to budget for at least Â£2,000 for each machine! This is a rough figure of course, but these are machines that don't have sophisticated sliding tables either, on the spindles for instance, but I will go into more detail at another time on this. So if you take the three most common machines, that's a minimum of Â£6,000 which you will need to spend. Of course you can spend much more on both separates or universals, so a universal does start to make a lot of sense, especially if you have limited space as well. As I have mentioned before, things are hotting up in the world of universals and this latest offering from Belgian manufacturers Robland, is going to make decisions as to which machine to buy, even more difficult! There really are some excellent quality universals on the market now. Robland have been known in the UK for some time through their original association with Startrite. Since those days of mainly machines for the home maker, they have developed their range and grown into a respected maker of quality industrial machinery too. 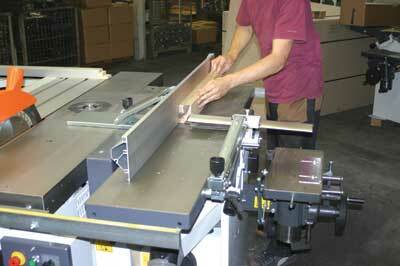 I was for some time, a proud owner of a piece of Robland machinery - a ZX 30 panel saw. At this level, main tables are of course cast iron, and in common with most manufacturers, they are cast by outside foundries and milled in the Robland factory. Robland use a planed finish on their tables, which is not everybody's cup of tea, but their use of this is very minimal, and the best I have seen of this type. The table edges of the NLX 310 universal are really deep; these are very substantial castings. There are some neat details on this machine, like the extension tables which are all cast and as solid as the main tables. The casing is a fabricated and welded steel structure, which again is substantial, and made at the factory in Bruges, as is almost everything on this machine. Good to see! One of the impressive features of the saw is its cutting capacity of 100mm (4in) in one pass; this is achieved with a 300mm blade (11 25/32in). This unit comes as standard with a scoring saw which is adjustable from the front of the machine - a feature I have come to like a lot, as in the past, these can be extremely fiddly to get right. 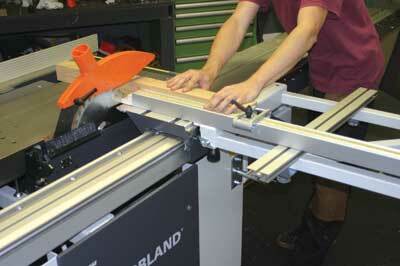 The Robland system can actually be adjusted as the saw is running too, and is very easy to do so. The rip fence on the NLX 310 I tested, is from the Knapp range - whom Robland bought a couple of years ago - and is an optional extra, but actually is not very much more expensive to add. This is excellent as you would expect, and beautifully engineered, although it has no fine adjuster and fixes to the rectangular type of bar. Personally, I prefer a round bar, but this rectangular bar works so well with this fence because it is such a good one. The motor too was slightly higher in specification than the standard, at 5hp - normally 4hp on three phase machines. 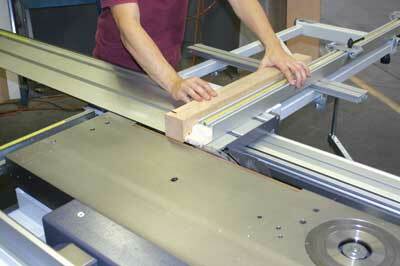 One of Robland's standard practices is to set the saw up with a good blade - something that is happening more these days. The NLX comes with a Freud, and very nice it is too. I cut up some very cheap melamine, which is truly awful stuff to cut cleanly, but the scoring saw on this universal made a perfect cut, with no break out at all. I liked the cross cut fence which is easily adjustable, and the middle support is simple to move too. Tilt is on the side with a handle that is quirkily reminiscent of a starter handle, but of course, it works. Rise and fall is a wheel on the front of the machine as is usual, near the main controls. Three motors switched in the usual way, are front mounted too. The Planer has a 3-knife cutter block which is also Belgian made - in this case by Gilco - and gave a good, fine finish on some ropey, cupped beech boards. 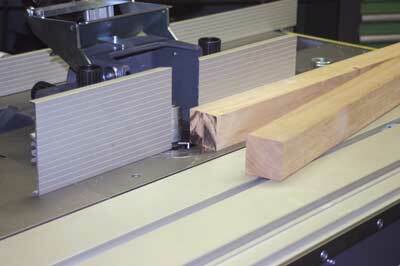 Surfacer depth of cut is adjusted by the usual threaded knob. The tables are winged for thicknessing and fold to the outside of the machine, which does take up more space than centrally mounted ones. The fence is the rip fence we met earlier, as is common on universals, so no need to comment here. The thicknesser is a central column rise and fall, and is based on Robland's 310 model, which has a good track record, having been around for many years. It is capable of 4mm (5/32in) depth of cut, but I never really take any notice of this as for furniture makers, taking that amount off in one pass usually means masses of tear out on hardwoods, which then requires loads more work to put right. All the extension tables are cast as I said, and these are the nicest I have seen on any machine. This NLX had one already fitted which lengthens the available bed space. 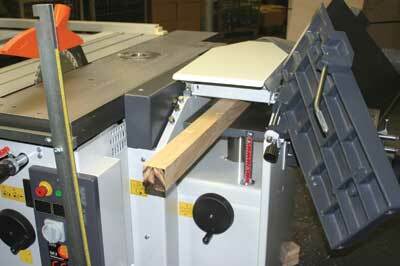 There is a neat foldaway piece for mounting an automatic feed - always a good idea on a spindle moulder I think. The spindle lock is to the rear of machine. There is an electrically breaked, four-speed spindle; 2900, 4000, 6000 and 7500. The belt is changed via pulleys. The spindle fence has a cast fence hood, with a very nice micro adjustment from both sides; this is again, a good, solid set up. One of the big advantages of a universal including a saw/spindle set up, is that you get a top-notch sliding table, which you would not normally get on anything other than an expensive spindle. As sometimes with these tests, my time using this machine was limited, and what I get is a qualitative snapshot. Having said that, I have tested quite a few of this type of machine now. 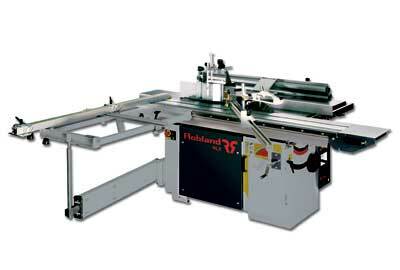 Going by my own experience of Robland machinery, this is the best from the company that I have experienced. Robland have really tried hard with this, and it looks to be a winner! The NLX has a lot going for it and has to go high on my own personal shortlist of universals. It is very nicely put together, feels good in use and has some well designed touches. I hope soon to reveal my thinking on this with some in-depth conclusions, but be patient; it needs more research yet! 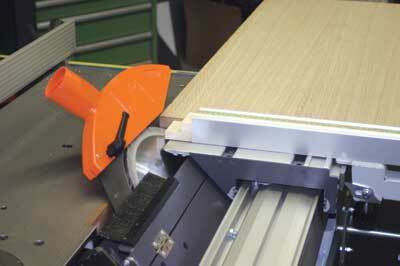 This is a well thought out piece of kit, offering a lot of machine for your money, and is quite incredibly good value, especially given the addition of the Knapp table. And if needed, the whole combination can be split to move for delivery too. The NLX 310 universal is a really serious contender in this market and should be given serious consideration if you are looking for a quality universal. 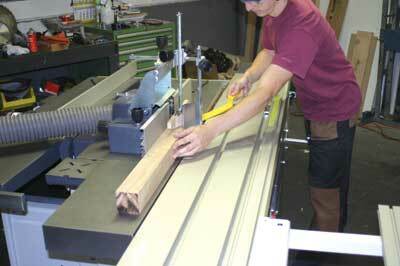 "As woodturners, we are fortunate that our lathes can help us finish"